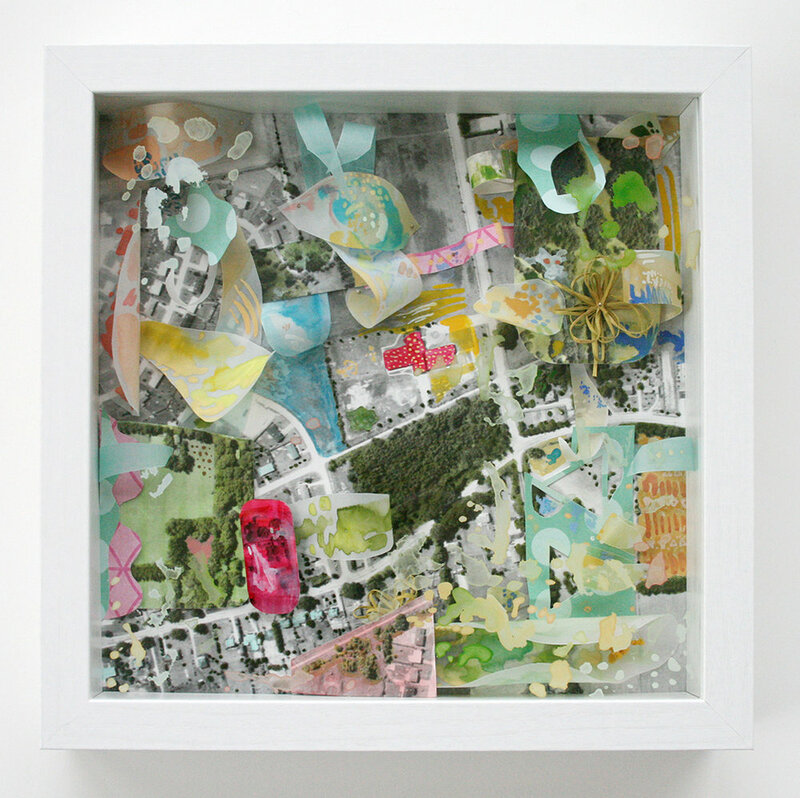 Wood, glass, gouache, black and white aerial photograph, marker, cotton, wool, steel pins, vellum, and cut paper. I had been experimenting with gouache and marker on vellum, and I envisioned something lively and dynamic. I bought this shadow box and trimmed the photo to fit, then colourized and cut up the main photo. I made a bunch of painted gouache and vellum shapes and pinned them in. I added the chopped up photo bits at different levels and some yarn and thread. Then I did more painting and colouring all over, adding colours to various bits and pieces so that it was more harmonious and interesting. At the last minute I decided to also paint on the inside of the glass itself, which I LOVE because it kind of casts these cloud-like shadows over the map pieces. I can’t wait to see what all the other ones look like now! 35 artists is an awful lot of artists! Many of my friends and other artists I know have taken a photograph, and they have such a wide array of practices, it’s going to be so interesting to see what happens. AND… I think I will make two more, one for each of my kids rooms, because I am kind of in love with how imaginative and bright they are.